Gum Arabic tree | Infonet Biovision Home. 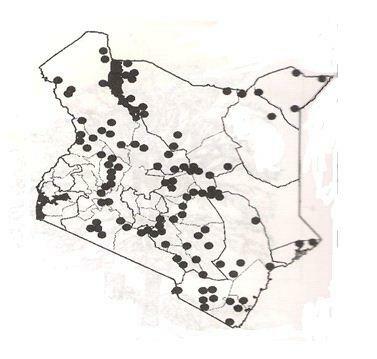 Bajun(Mtengewa); Boran (Baabido); Daasanach (Dang'ite); Digo (Chikwata); Gabra (Idaado); Kamba (King'olola); Luhya (Kumung'ang'a); Luo(Otiep); Maasai (Enderkesi); Mbeere (Mung'ora); Orma (Bura diima); Pokot (Chemanga); Rendile (Mirgi); Samburu (Manok); Somali (Adad); Swahili (Kikwata, Mgunga); Teso (Ekodokodoi); Turkana (Ekunoit). It is native to Angola, Botswana, Burkina Faso, Eritrea, Ethiopia, Gambia, Kenya, Mali, Mozambique, Namibia, Niger, Nigeria, Senegal, Sudan, Tanzania, Uganda, Zambia and Zimbabwe. It is common in the dry parts of Africa and Asia. 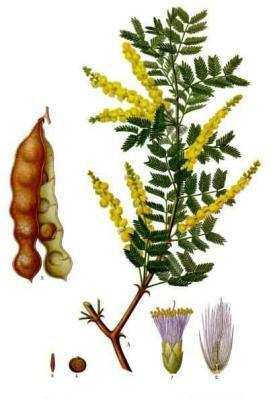 In Kenya, it is widespread in the ASALS of Kenya in dry Acacia-Commiphora bush land. A. senegal has clear to pink or yellow edible gum produced when the tree bark is wounded. It is picked and eaten casually by people living in the dry north of Kenya, and extensively cultivated in Sudan for its gum. Flourishes in the altitude range of 100 to 1700 m above sea level; Mean annual temperatures -4 to 48 deg. C and mean annual rainfall of 300 to 1200 mm annually. Soil type varies from coarse-textured, deep sandy soils to dry, rocky soils, slightly acidic to moderately alkaline. It is intolerant to waterlogging and prefers well-aerated soils, especially rocky, loam or sandy soils. It is distributed in agroecological zones III - VII. It can be propagated by direct sowing at site and grows slowly in arid lands. It occurs in woodlots and mixed farming systems. Weeding should be immediate in the season following planting and in the following two consecutive growing seasons. Young trees must be protected from livestock browsing on them. Lopping, coppicing, pruning and appropriate injuring for production of gum arabic are employed in tree management. Seeds should be harvested before pods drying for easy collection and to avoid insect attacks. Seeds are then easily extracted by hand, then, they are should be immediately dusted with an insecticide. Food; seeds are dried and conserved for human consumption as a vegetable. It also produces edible gum. Fuel; produces excellent fuelwood and charcoal, sometimes it may be the only surviving species in the dry areas. Timber; a source for poles, posts and toolhandles. Medicine; the roots are used for medicine extraction for treating dysentery, gonorrhea and nodular leprosy. Fodder; the pods and leaves are used as fodder for camel and goats. Apiculture; it is a source of bee forage, soil conservation, sand stabilization, Commercial "gum arabic" and resin; it is commercially exploited for making food stabilizer, glue, pharmaceutical uses. Erosion control; A. senegal can be used for desertification control, re-establishment of a vegetative cover in degraded areas, sand dune fixation and wind erosion control due to their tolerance for water scarcity. Soil improver: Improves soil fertility by nutrient cycling after leaf fall. Ornamental: It is grown as an ornamental tree in some parts. Boundary or barrier or support: cut branches are useful for fencing in cattle rearing due to their spines. Intercropping: It is a good species for agroforestry systems; it has been grown in combination with watermelon, millets and forage grasses. Seedlings are susceptible to the buffalo treehopper (Stictocephala bubalus) attacks. Spiders the Cyclops sp., can smother young growing apices. Coleoptera (bruchids), Lepidoptera, and Hymenoptera can damage the seeds during their larval stage of development. Locusts, Acridium melanorhodon cause widespread damage by defoliating them in an overnight. Other A. senegal enemies include; the fungi Cladosporium herbarium, Fusarium sp., Ravenelia acaciae-senegalae and R. acaciocola.